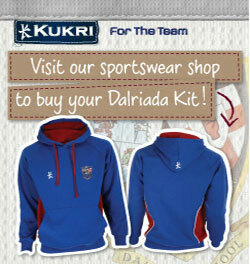 Dalriada had the honour of being one of four schools, selected by CCEA, who were asked to share good practice. The Speaking and Listening unit of the GCSE English Language course is worth 20% of the overall exam and to fulfil the criteria pupils must perform a variety of oral tasks, both individually and as part of a group. 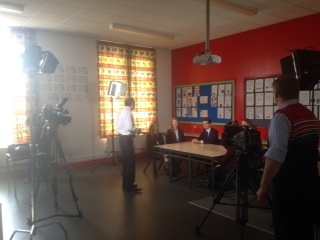 To assist in teacher training and exam standardisation, CCEA asked Dalriada pupils to complete several tasks, whilst being recorded. This DVD will eventually be distributed to all exam centres to enable effective marking. Our pupils certainly rose to the occasion, with the moderator (Mr S Lambe) stating that he can now show ‘clearly what an A* performance looks like’. It was an interesting experience for the pupils and the English Department were very proud of all those who participated. 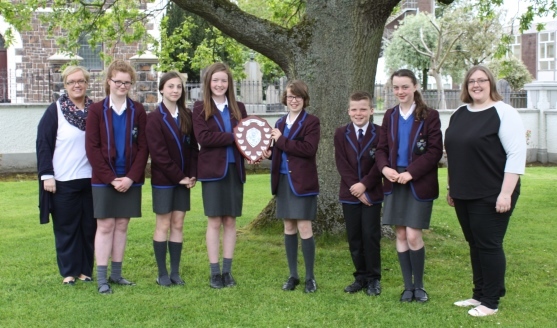 On Monday 22nd June 2015 four boys and six girls from Year 10 competed for the Jonathan Logue Public Speaking Cup. This year the standard was, as ever, extremely high presenting the judges with great difficulty in awarding the top three places. Our judges were two previous – and much loved – members of the English Department here at Dalriada, Mrs Mary Doherty and Ms Hilary Timmons, who kindly returned to be part of this annual Key Stage 3 event. This year a good range of topical and controversial topics were chosen from the popularity of eBooks to Is Consumerism Killing the Earth? We had a brand new topic chosen by Daniel Steele who wanted to advise us on the opt-out organ donation system while we also enjoyed Kate Beattie’s time-travel tour of society 20 years ago –where there wasn’t a smartphone in sight! The runners up were also congratulated on their speeches – they had, indeed, made the judges’ decision very difficult. 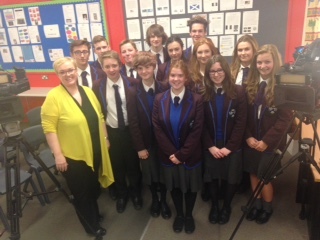 The English Department continue to be blown away by the talent and diligence displayed by the pupils of Dalriada – once again, we are very proud! Many thanks to all the Year 10 pupils who prepared talks, and to the members of the English Department who supported this work. Let’s hope we can maintain this standard next year. It all started back in January, when the Junior Drama Club decided that they would like to move on from all the drama games and short scenes which we had been working on, and focus on a much bigger goal: a Junior Drama Club Performance in front of a large audience! It was revealed that the Junior Drama Club would be performing an abridged version of Shakespeare’s comedy, Much Ado About Nothing. There were a large number of pupils keen to walk the boards, and, after auditions had taken place, the cast list of 25 pupils was finally revealed! 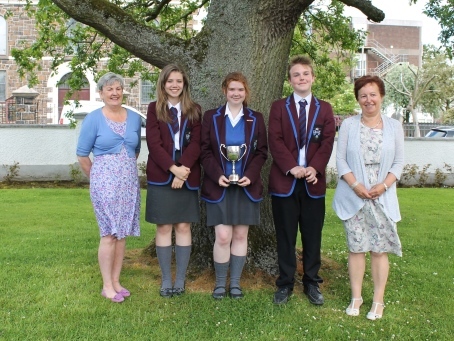 Three pupils from 8M, representing Armour House, won a hard-fought competition on Monday 10th June in the 4th annual Year 8 spelling competition. Throughout the year, all first year pupils have been learning sixty new words of a higher order from George Orwell’s Animal Farm, in their English classes. Not only did they learn each spelling, but also, and very importantly, the meaning, so they will be able to use this ambitious vocabulary in their own writing. The Connell Guides website announced. A Sixth Form student from Dalriada School, Ballymoney has been selected as the winner of our nationwide Connell Guides essay writing competition. Susanna Crawford, age 17, wrote a strikingly witty appraisal of J.D Salinger’s Catcher in the Rye which caught the attention of our judge, novelist William Boyd. He chose her 1,500 word essay amongst more than two hundred other A and AS level entries from all over the UK. In November, Year 10 got to go to the Riverside Theatre, Coleraine to see a production of Willy Russell’s Blood Brothers. I really enjoyed this production. I was hooked throughout the whole show and could not take my eyes off what was infolding on the stage! The cast were all brilliant actors/ actresses who played their characters to perfection! I really liked the contrast between the characters- no one person in the play was the same. They were all different and worked in unity to make the production the best it could be. Once we were all seated, the lights dimmed and the play began. It started with a narrator who would make several appearances later in the show. I think this character could have been created a little better as he created an eerie, unfriendly atmosphere; his voice was dark and evil and his costume was menacing and intimidating. In my opinion, he should have been directed differently, with an alternate characterisation, to give him a friendlier, more positive character. The play then moved to the opening scene, which was of a woman singing. Later, we found out that she was named Mrs Johnston. The opening scene of anything is very important and this was no exception: the song sung in this scene gave a structure to the whole play as it was sung and referred to throughout the rest of it. It was set in a poor street in a rough part of town. You could tell by the clothing that they were poor. I thought the actress playing Mrs Johnston played the part of a poor, hard-working mother who was obviously under stress, very well. As the play progressed, new characters were introduced, such as Mickey, Eddie and Linda. Mickey and Eddie were the two main characters in the play and, as you might have guessed, they were the ‘Blood Brothers’ mentioned in the title. Mrs Johnston had given birth to these two boys, but already had several children and, being in the situation that she was in, she couldn’t take care of two new children. Her employer (Mrs Lyons) had always desperately wanted a son and now a perfect opportunity had been presented: she managed to negotiate her way in, and, with much unwillingness and, later, many regrets from Mrs Johnston, Mrs Lyons took one off the twins under her care. She took Eddie while Mrs Johnston kept Mickey. They swore never to let the twins know that they were brothers. Plot lines developed and questions were asked as we followed the lives of these twins. Eddie grew up as a wealthy, posh and well-educated boy while Mickey grew up on the rougher side of town; he became a mischievous, playful and bad-mannered boy. Mickey grew up having as much fun as he could while Eddie grew up not knowing the meaning of fun. As you can see, they are quite the opposite. As time progresses they eventually cross paths and meet new people, still not realising that they are twins. I’ll leave the rest for you to discover for yourselves, but I will give mention to the ending: with their dying breath the boys discover their true identity and die the same way they were born: together. This is a brilliant production- the actors and actresses’ story-line, characters, everything about the play was great! Even the seats were comfy and the theatre had a good layout! Overall, this is a fantastic play that I would recommend to anyone and I would definitely see again! It was a great, rather than a small, pleasure to spend a winter evening at the end of 2013, watching Dalriada’s production of Lionel Bart’s “Oliver!”Seasoned audiences perhaps take it for granted that the orchestra for a Dalriada show will be made up almost entirely of pupils; this is certainly not the case at all schools but under Heather Montgomery’s skilful (or is it magical?) baton this year’s talented young musicians sounded to have no problem interpreting the complicated musical score. The blend of brass, woodwind and strings was underpinned by a range of percussion instruments played by only two performers who understood entirely what was demanded of them. We, in Year 10, were delighted to welcome debut novelist Debbie McCune to Dalriada on Tuesday, 4th June. The library was closed for the morning and all of us who had ticked the English Literature box on our GCSE options sheet were invited to join Debbie for an insight into the world of writing and publishing. Debbie’s novel Death and Cohas recently been released and we didn’t miss the opportunity to buy a copy from the Waterstone’s representative, which Debbie kindly agreed to sign. We were then treated to an intriguing workshop on creating and developing character and setting. Swirling around the library – and our imaginations – there was talk of fabulous necklaces, large dogs, spooky forests , angry yet romantic characters, train stations, scars and painful shyness to name but a few. What we didn’t imagine, though, was how Debbie inspired us to get writing and to take the plunge by putting our writing ‘out there!’ We left that library knowing that if we felt like writing, then that’s exactly what we should be doing, so off we went . . .to enter that first Young Writer’s competition. Wish us luck!